Once upon a time (actually, as recently as last year), I didn’t like summer squash. The quantity of zucchini and crooknecks and patty pans that I’ve consumed over the past couple months alone makes that seem impossible, but it’s true. I tried it, and tried it again, and found it bland and wet and useless. A total waste of my attention. Well, it turns out, and I’m finding this is true in the case of many people who dislike certain vegetables, that I’d just never had it prepared well. I’d only ever eaten it at the hands of moms who were putting it on the table solely to fill the requisite veggie slot. Thinking back, I can’t even fathom what they must have done to it to make it so awfully unpalatable. It’s such a pure, basic, softly sweet type of vegetable—no harsh edges, fresh and crisp when raw, meltingly tender when cooked, and stunningly versatile. I am so glad I decided to try it in my own kitchen. It’s been such a joy to discover that it really doesn’t take much to make this summer staple taste great, especially since it always shows up in such abundance. My favorite preparation this year has been one of the easiest: slices of young yellow squash, roasted with fresh thyme from my garden and topped with crumbles of soft, creamy chevre. It’s colorful and lovely, and it’s simple. The squash softens and sweetens in the oven, caramelizing slightly. Fragrant thyme adds earthiness and the milky tang of the goat cheese makes this otherwise sensible-seeming dish just the tiniest bit decadent. So, if you’re not yet on board with the summer squash—or are finding yourself growing bored as the season begins to wind down—give this preparation a try. It’s a favored regular at our table. In a bowl, toss the squash slices with 1 teaspoon of the thyme, enough olive oil to lightly coat, and a generous pinch of kosher salt. 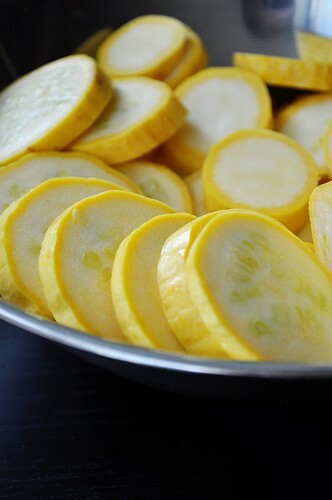 Place the squash slices on a baking sheet in a single layer and season with a bit more salt. Roast the squash for 15-16 minutes, turning once halfway through. 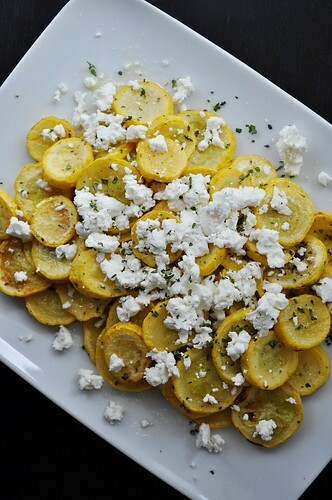 Remove the squash from the oven and place on a serving platter. If you’d like, drizzle on a little more fresh olive oil and add another sprinkling of salt. Crumble the chevre over the squash and top with the remaining half teaspoon of thyme. Serve warm or at room temperature. 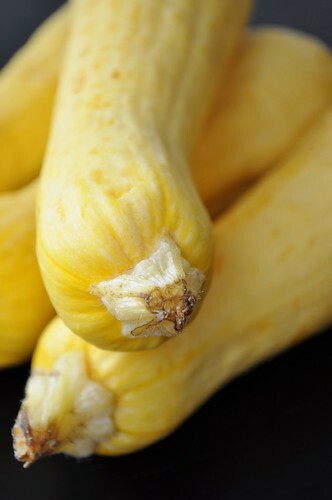 I love squash- it tastes great and it's healthy, too! Have you ever tried squash pear soup? It's awesome! 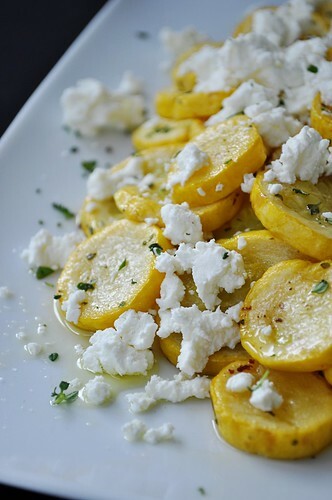 I stumbled upon this recipe on Pinterest the other day, and I must agree, this is truly a wonderful recipe and a great approach to yellow squash. 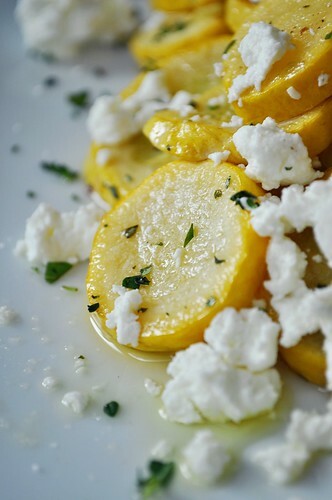 The sweetness of the squash and the creaminess of the goat cheese go together like peas and carrots! Well, these have become a summer staple! What great flavor with the rosemary and goat cheese addiing just the right amount of punch. Thank you for the refreshing, summery recipe. Looks delicious! I want to make it tomorrow! My husband and and I loved this receipe. It was delicious and so simple. I will definitely make it again and soon!